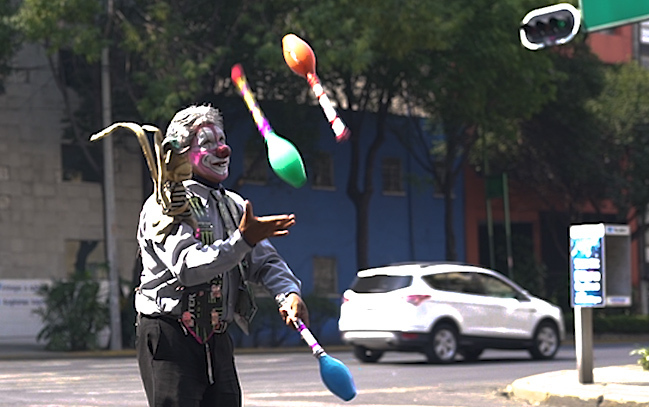 MEXICO CITY, 11 March 2017 — A juggling clown practices his craft for money from passersby at a busy intersection in the Mexican capital. Unemployment and underemployment have been nagging problems for Mexico since I’ve known the country, which is for the past 40 years. I returned to Mexico in March 2017 to shoot the pilot for a global documentary series on freelance foreign correspondents called, “FREELANCERS with Bill Gentile.” I began my career as a freelance foreign correspondent in Mexico in 1977 just after graduate school. “FREELANCERS” is supported, in part, by American University, where I created and where I teach the course, “Foreign Correspondence.” So this project blends in perfectly with my teaching responsibilities at the university, and with the overall objective of the institution, which is to encourage students to embrace — and perhaps to help change for the better — the world we live in. I’m just a few days away from launching a crowdfunding campaign to pay for post-production that includes editing, music, color correction, promotion, etc. During the Indiegogo campaign, I’ll be asking NOT just for contributions. I’ll be asking contributors to help show the world who these independent freelance foreign correspondents are, and how they send us the information we need to make crucial decisions about our lives and the countries we live in. We’re all in this together. And the stakes are so high.